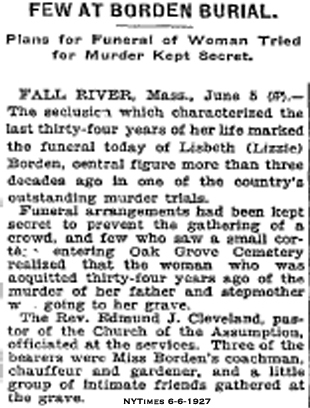 A chapter of history was closed on this date in 1927 with the death of accused but acquitted murderess Lizzie Borden. She died at age 67 on June 1, 1927. 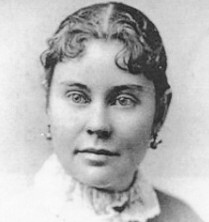 It was the end of an era, yet the continuation of a never-solved mystery: Did 32-year-old Lizzie Borden hack her father, Andrew Borden, and stepmother, Abby Durfee Borden to death on August 4, 1892? 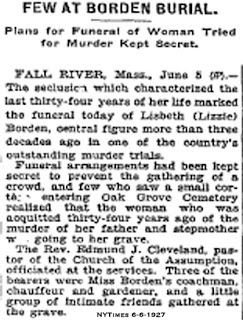 Lizzie was acquitted of the crimes after a two-week trial that garnered coverage from across the country. Sadly, we still don't know the full truth about what really happened that day. Many, of course, say she committed the murders for the oldest of reasons, greed, jealousy, anger. Did she want more in life after taking her Grand Tour trip to Europe? She certainly wasted no time after the murders, moving to a grand house up on "The Hill," the more prestigious part of town. That home, which she dubbed "Maplecroft," will be opening soon as a new B&B (see inside photos and story) by the same owners of her original home, the murder house and now the Lizzie Borden Bed and Breakfast Museum on Second St.
Judging from Lizzie's will, she lived well. See details of her will here. In fiction, of course, anything can happen. What if Lizzie's life had turned out differently? What if she had to commit the murders because her father and stepmother had become... zombies? 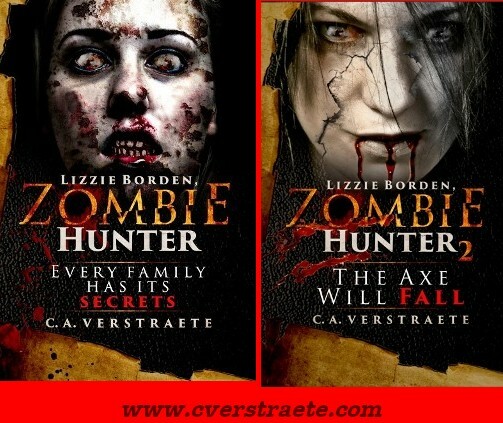 See Lizzie Borden, Zombie Hunter. What if Lizzie thought her life was back to "normal," or as normal as it can be after the murders. Then... the zombies come back and she is forced, albeit reluctantly, to pick up her axe again... That's what happens in the sequel, Lizzie Borden, Zombie Hunter 2: The Axe Will Fall.